Daniel Anguilu started painting graffiti at an early age. Mostly using freight trains and walls as his canvases, his art is increasingly visible around his hometown of Houston, Texas. Anguilu has been invited and traveled to many cities in the US, Mexico, Peru, Spain, and Italy to paint graffiti and to participate in graffiti art exhibits. He has also visited Asia, Africa, and Central America to enrich his knowledge of pre- colonial art and the cultures in those regions. Anguilu’s style is deeply inspired by his Mexican heritage, and mostly manifests itself as large scale, aerosol murals. Anguilu strongly believes in freedom of expression and the need to use this expression to decorate public spaces. Anguilu’s recent projects include Famous Monsters at Lawndale Art Center, Houston TX (2012), and has participated in group exhibitions at The Station Museum, Houston TX (2012), Cardoza Fine Art, Houston TX (2012); the Orange Show, Houston TX (2011); Mexican Consulate of Houston, Houston TX (2007); Aerosol Warfare Gallery, Houston TX (2005), and the Poissant Gallery, Houston TX (2001). Currently, Anguilu is focusing on painting public spaces in the Houston area and working in collaboration with local business and homeowners. 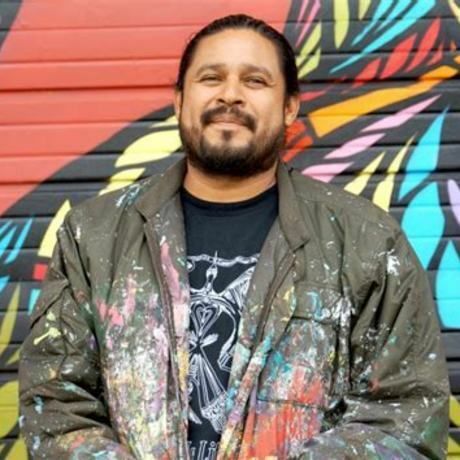 Through his many conversations with Houstonians over the years, Anguilu has noticed that many people, whether involved in art or not, support his efforts to bring his art to our public spaces.